Have you ever wondered why your ears pop when you fly on an airplane? Or why, when they fail to pop, you get an earache? Have you ever wondered why the babies on a plane fuss and cry so much during descent? It is the middle ear that causes discomfort during air travel because it is an air pocket inside the head that is vulnerable to changes in air pressure. Typically, each time (or each 2nd or 3rd time) you swallow, your ears make a little click or popping sound. This occurs because a small bubble of air has entered your middle ear, up from the back of your nose. 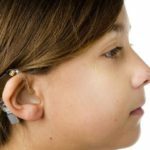 It passes through the Eustachian tube, a membrane-lined tube about the size of a pencil lead that connects the back of the nose with the middle ear. The air in the middle ear is constantly being absorbed by its membranous lining and resupplied through the Eustachian tube. In this manner, air pressure on both sides of the eardrum stays about equal. If, and when, the air pressure is not equal, the ear feels blocked. The Eustachian tube can be blocked, or obstructed, for a variety of reasons. When that occurs, the middle ear pressure cannot be equalized. The air already there is absorbed, and a vacuum occurs, sucking the eardrum inward and stretching it. Such an eardrum cannot vibrate naturally, so sounds are muffled or blocked, and the stretching can be painful. If the tube remains blocked, fluid (like blood serum) will seep into the air from the membranes in an attempt to overcome the vacuum. This is called “fluid in the ear,” serous otitis or aero-otitis. The most common cause for a blocked Eustachian tube is the common “cold.” Sinus infections and nasal allergies (hay fever, etc.) are also causes. A stuffy nose leads to stuffy ears because the swollen membranes block the opening of the Eustachian tube. Children are especially vulnerable to blockages because their Eustachian tubes are narrower than in adults. Air travel is sometimes associated with rapid changes in air pressure. To maintain comfort, the Eustachian tube must open frequently and wide enough to equalize the changes in pressure. This is particularly the case when the airplane is landing, going from low atmospheric pressure down closer to earth where the air pressure is higher. Any situation in which rapid altitude or pressure changes occur creates the problem. You may have experienced it when riding in elevators or when diving to the bottom of a swimming pool. Deep sea divers are taught how to equalize their ear pressures; so are pilots. You can learn the tricks too. If you have a cold, a sinus infection or an allergy attack, it is best to postpone an airplane trip. Decongestant tablets and sprays can be purchased without a prescription . However, they should be avoided by persons with heart disease, high blood pressure, irregular heart rhythms, thyroid disease or excessive nervousness. Such people should consult their physicians before using these medicines. Pregnant women should likewise consult their physicians first. Even after landing you can continue the pressure equalizing techniques, and you may find the decongestants and nose sprays to be helpful. (However, avoid making a habit of nose sprays. After a few days, they may cause more congestion than they relieve.) If your ears fail to open, or if pain persists, you will need to seek the help of a physician who has experience in the care of ear disorders. He/she may need to release the pressure or fluid with a small incision in the eardrum. ©1996. American Academy of Otolaryngology-Head and Neck Surgery, Inc. This leaflet is published as a public service. The material may be freely used for non-commercial purposes so long as attribution is given to the American Academy of Otolaryngology-Head and Neck Surgery, Inc., One Prince Street, Alexandria, VA 22314-3357. For more information, visit our home page at http://www.entnet.org.